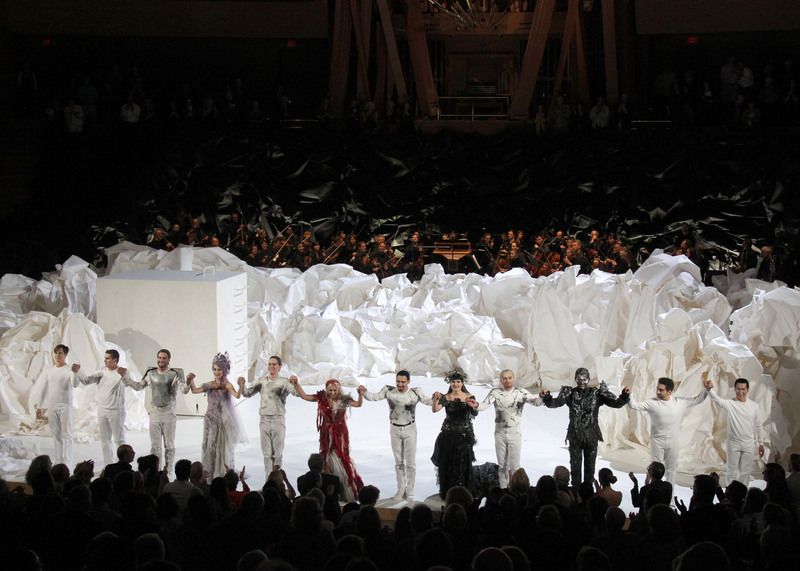 LA Phil’s production of Mozart’s Don Giovanni at Walt Disney Concert Hall led by Gustavo Dudamel, in collaboration with Frank Gehry, Rodarte and Christoper Alden. Photo by Mathew Imaging. 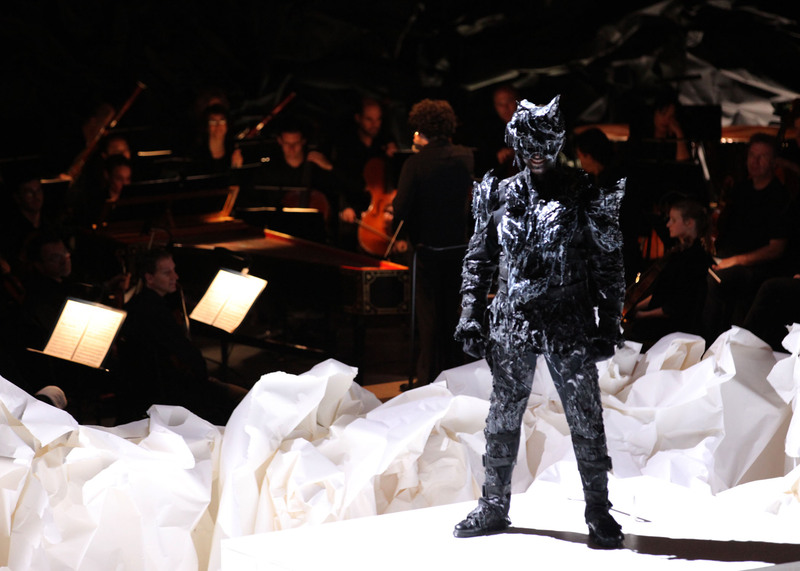 Even before the overture started at last night’s LA Philharmonic performance of Mozart’s Don Giovanni, it was clear this wasn’t going to be Gustavo Dudamel’s Don Giovanni. 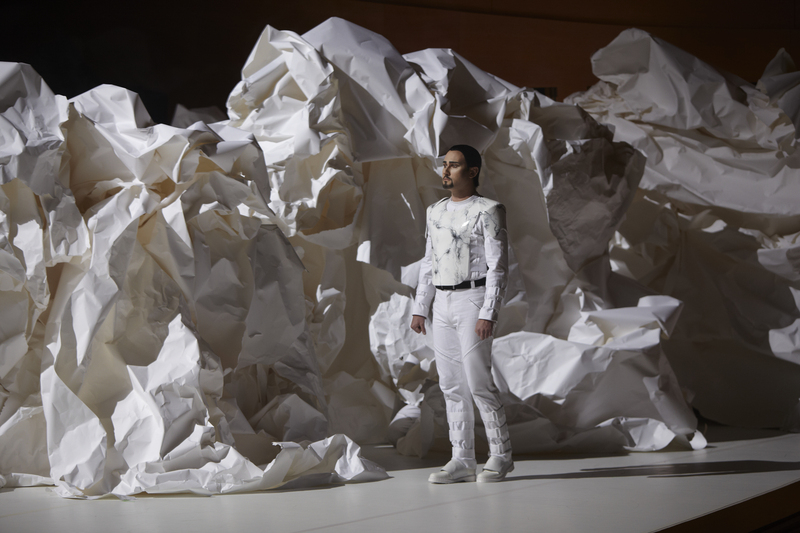 The 31-year-old music director seemed quite pleased to be taking a back seat to Walt Disney Concert Hall architect Frank Gehry, who created the sets for the production, and the fashion-house team known as Rodarte, who designed the costumes. Since there’s no curtain at Disney Hall, upon entering the auditorium, the wow factor of Gehry’s sets was instantaneous. 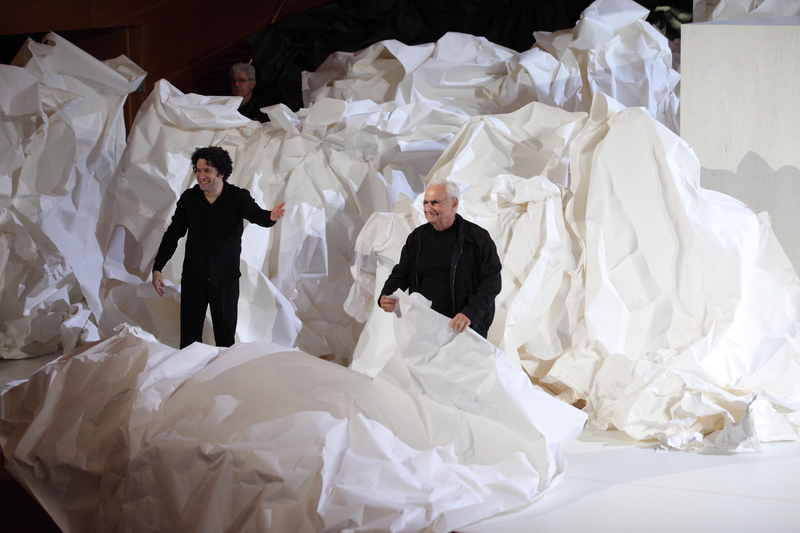 Giant heaps of paper floated on stage like rumpled icebergs among larger stark white plywood boxes. Before the overture began, a woman (Donna Anna, we would learn later) climbed atop the tallest of the boxes and proceeded to writhe around sexily throughout the duration of the overture. Polish baritone Mariusz Kwiecien was a powerful Don Giovanni. I like my DGs a bit on the raw side and Kwiecien’s voice had just enough of an edge for me. Another casting highlight was Carmela Remigio as Donna Anna, who seduced even those of us in the audience with the aforementioned writhing and self-groping at the top of the show. Her milky tone and flawless technique proved she was more than just a bombshell. 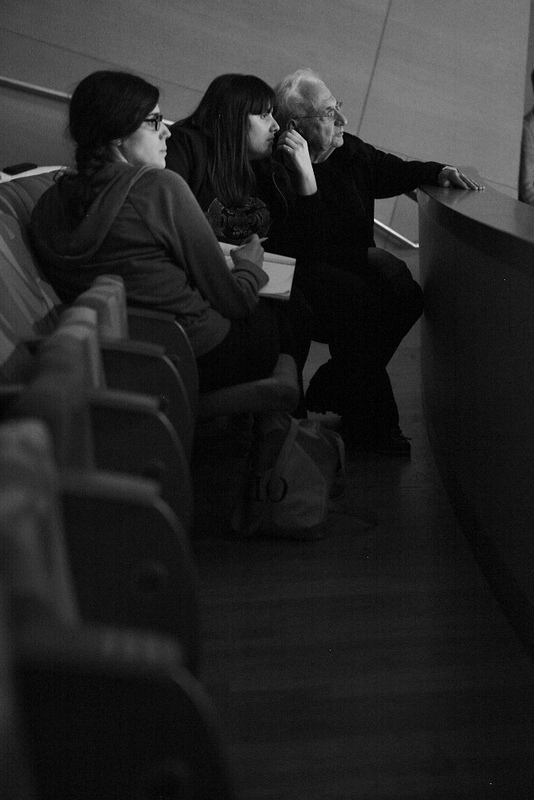 “Non mi dir,” in Act 2 elicited the biggest cheers of the night. Anna Prohaska was a sweet and earnest Zerlina. Stefan Kocan a robust and menacing Commendatore. Pavol Breslik (Don Ottavio) and Ryan Kuster (Masetto) were the weakest of the cast; and Aga Mikolaj (Donna Elvira) sounded like she was battling a bit of a head cold, so I’ll reserve judgement on her performance. Photo by Autumn de Wilde. Aga Mikolaj (Donna Elvira). Photo by Autumn de Wilde. Now…about those Rodarte costumes. Like the Gehry sets, they were all white with a few exceptions. Donna Elvira wore a black Swarovski-bedazzled gown with a long train. And Zerlina was the only character not clad in black or white. 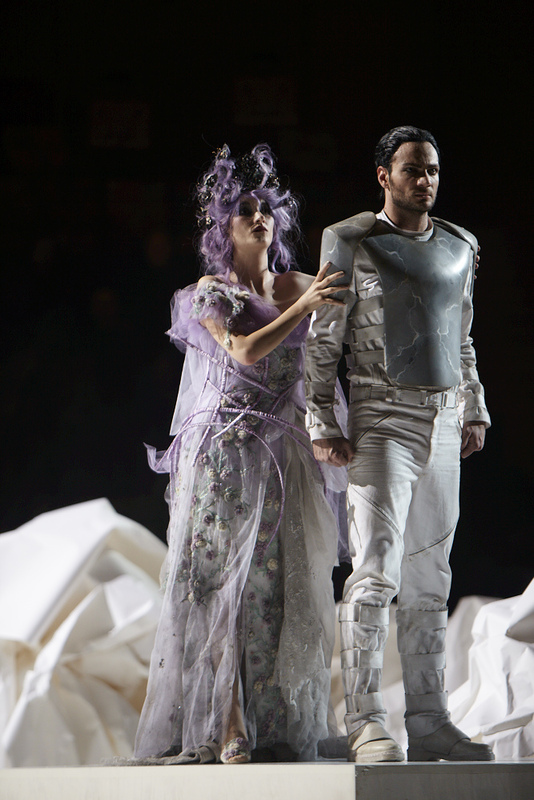 Anna Prohaska (Zerlina) and Ryan Kuster (Masetto). Photo by Autumn de Wilde. Her flowing, tuile gown of lavender had green and purple flowers sewn into the skirt. 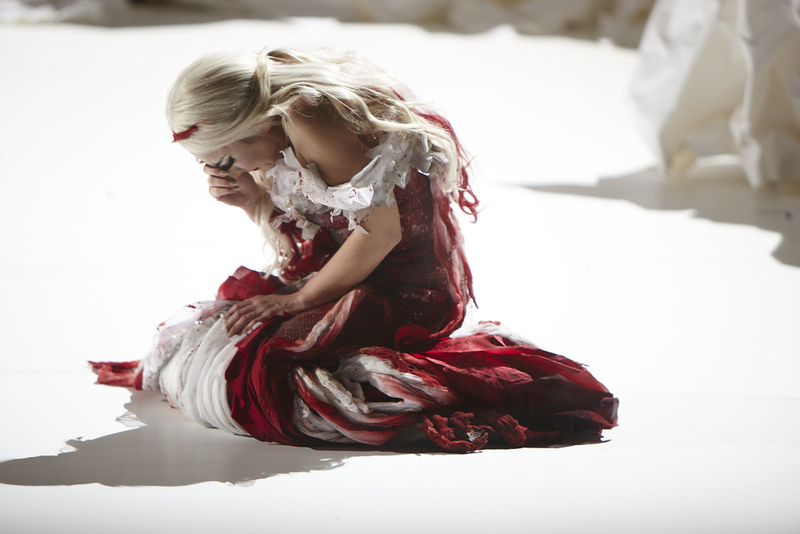 To my eye, the dress Donna Anna wore in the second act–an artfully tattered deconstruction of her pure white Act 1 gown, splashed blood-red–was an absolute masterpiece. 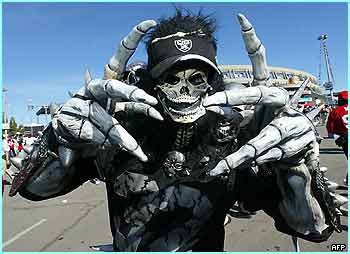 The Commendatore’s costume at the end looked a bit like a cross between the Oakland Raiders mascot and something the members of the rock band Kiss would wear, but it definitely had the creepy factor necessary for the scene. Stefan Kocan (The Commendatore). Photo by Mathew Imaging. Gustavo Dudamel coaxed a crisp, clean performance from the musicians of the LA Phil, who we get to hear play opera all too rarely. 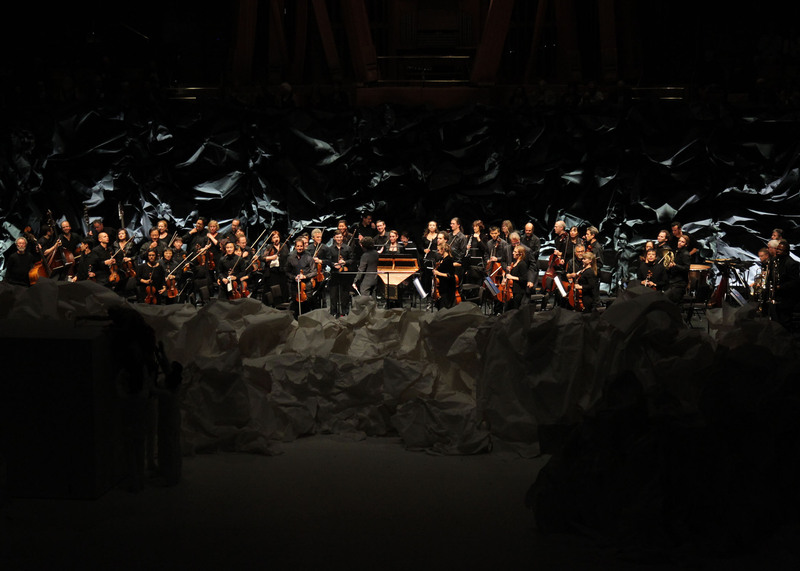 The distance from the orchestra–which was seated behind the stage, just underneath the organ (no pit at Disney Hall), and was wrapped in a black version of Gehry’s paper crumples–to the singers in front of them proved to be not much of an ensemble challenge. There were TV monitors scattered all around the hall with the “conductor cam” view on screen, so the singers could see Dudamel just fine from any angle. Gustavo Dudamel. Photo by Mathew Imaging. 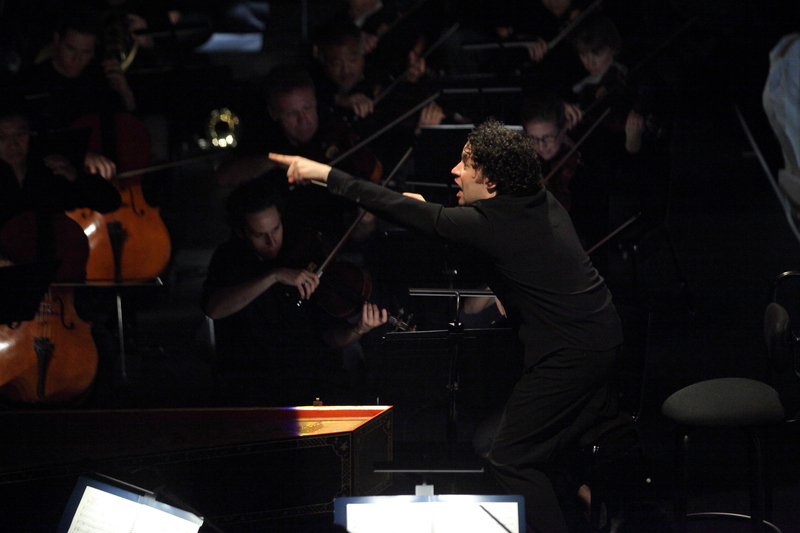 The LA Phil, conducted by Gustavo Dudamel. Photo by Mathew Imaging. Dudamel appeared to be having a blast all evening. Now nearly three complete seasons into his tenure, we’re getting used to seeing him conduct things from memory. You know: Mahler symphonies, the Verdi Requiem, no big deal. He did so again last night. Which, when you think about it, is awfully impressive. A three-plus hour opera, with all the intricacies of transitions from recitatives to dialogue to arias solidly etched in his mind. This guy lives and breathes music. It’s kind of like Kobe Bryant. We’re so used to his super-human performances on the basketball court sometimes we take his performances for granted. Dudamel is becoming Kobe. His efforts on the podium are so masterful so often. But through it all last night, Dudamel didn’t make things about him. He never does. 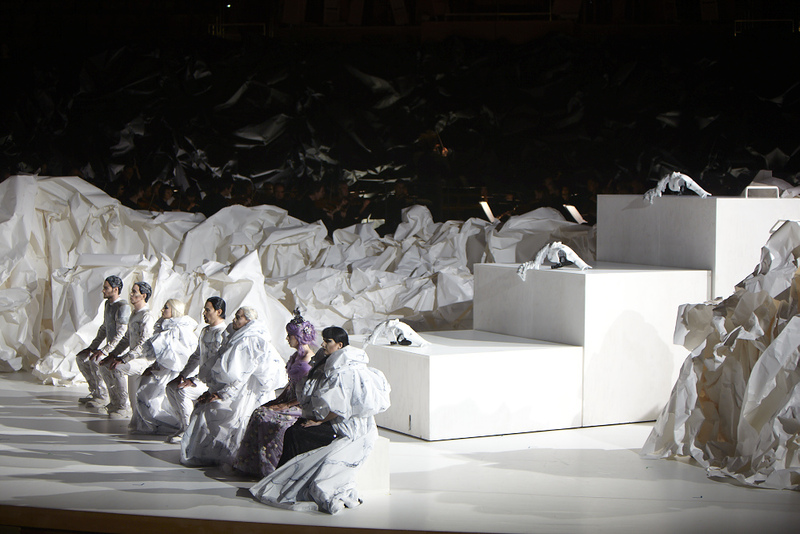 What could have easily been Dudamel’s Don Giovanni wasn’t. It wasn’t even Gehry’s or Rodarte’s or Christopher Alden’s. It was, ultimately, Mozart’s Don Giovanni. And what a special performance it was. 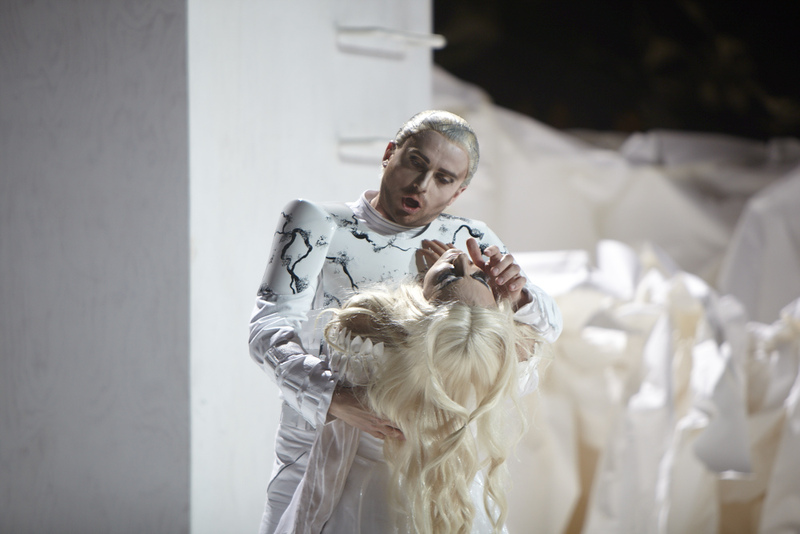 Additional performances of Don Giovanni at Walt Disney Concert Hall take place May 20, 24, and 26. Tickets are in very limited supply. Notes: William Skeen joined the LA Phil on baroque cello for the recitatives, providing a delightfully colorful and, at times, improvised continuo. 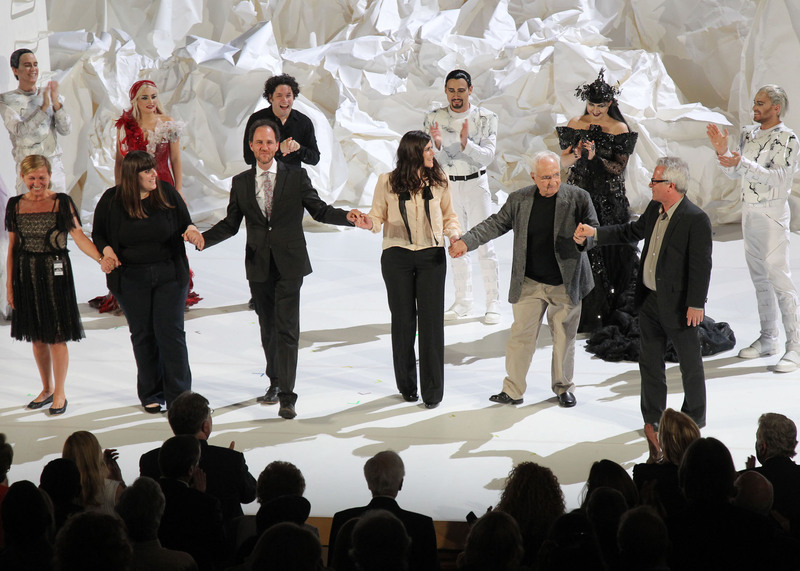 Frank Gehry and Kate and Laura Mulleavy of Rodarte were all in attendance and joined the cast for curtain calls. Lighting designer Adam Silverman kept with the black-and-white theme by employing nothing but varying shades of white in his design, to stunning effect. I disagree with your conclusion that this event was “ultimately, Mozart’s.” The strange set, costumes, lighting, and slow motion ultimately, and regrettably, distracted from the music, however well it was performed. Anything Frank Gehry wants to do is fine with me. I think that if Dudamel draws people into the crocents and draws the music out of the orchestra then the experience of listening will ignite a spark in each individual that will cause them to seek out the unmatched depth and intoxication of classical music irregardless of the stature of the conductor, prestige of the ensemble or price of the ticket. Like Bernstein’s Philharmonic, the real triumph was his connectivity with ears and eyes that normally would not have entered the symphony hall doors. (See Bernstein’s Young People’s Concerts and personal compositions)Not to say that exposure is everything, but enough people have stereotyped classical music as being out of date, that if there is someone out there making it more relevant AND still caring for authenticity and quality, I think it will only invest good into the musical world. Spread little Dudamel virus, spread! I just saw the Sunday matinee, and I agree with you: What an exceptional production! Today, there was nothing weak about the performances of Pavol Breslik (Don Ottavio) and Ryan Kuster (Masetto); and Aga Mikolaj (Donna Elvira) sounded absolutely perfect! This Don Giovanni is a gift from the Heavens! Glad to hear it! Maybe what I heard were opening night jitters? Surely not. In any event, pretty amazing to mount this production with only about two weeks of rehearsal. Most opera productions get at least a month. I was incredibly shocked that you carelessly forgot to mention one very important person in your “notes”: Caren Levine joined the LA Phil on Harpsichord for the recitatives, and played them brilliantly. Without the harpsichord, the cello continuo would not exist. I actually found this more enirteaintng than James Joyce.